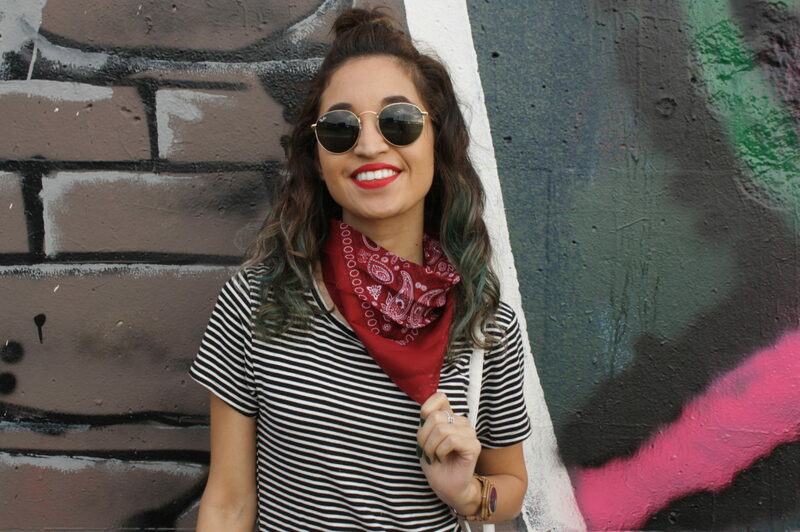 A bandana is an accessory that can add that extra zing to your wardrobe. You can tie it in different ways to flaunt the retro, Western, Rockabilly or biker chic styles, to mention a few. The below tutorials guide you in tying it for a number of different looks. When it comes to tying your hair, you can never go wrong with the trendsetting hip-hop and gypsy styles. The bandana allows you to do all that and more. Fold a square bandana into a triangle and fold the tip up to reach the upper margin. Now fold it at the middle so that you have a narrow band of cloth with tapered ends. 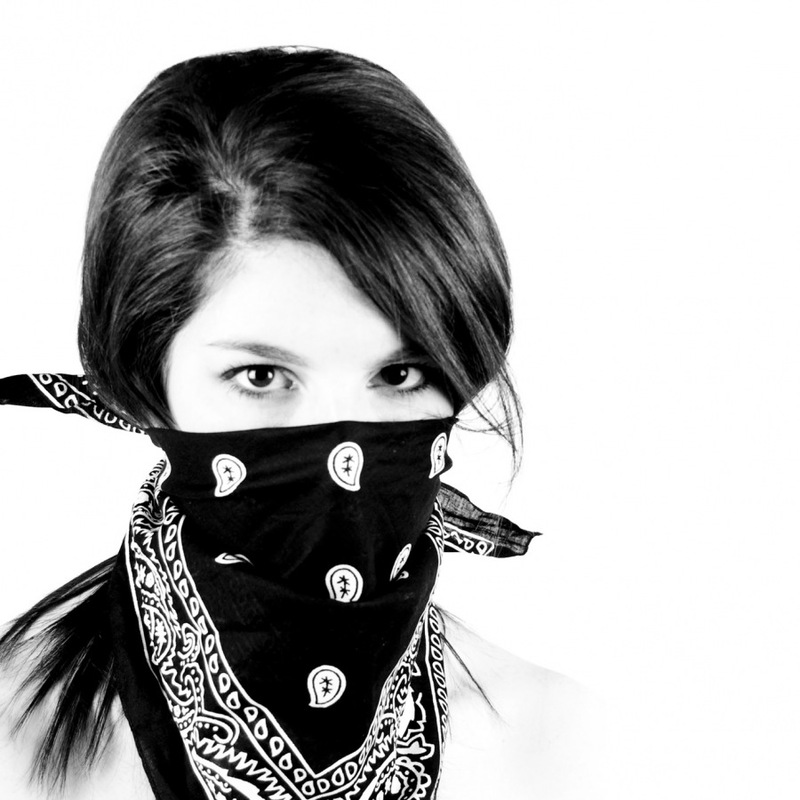 Wrap the bandana around your head from the back. Make a knot in the front with the ends. Adjust and you are done. It works well with long and short hair left open or tied in a bun, ponytails and You can also try this pin-up style with curly hair and dreadlocks. Do it with stiff fabric and leave out ample ends to make the headband resemble bunny ears. Fold the bandana into a triangle. Cover your head with it up to your forehead. Take the two opposite tapering ends and tie a knot at the back of your head. The 3rd end should hang below the knot giving you the cool bandit/gangster look. It is also the Cholo or Mexican style of wrapping the fabric. Chemo patients often use this tie for hiding hair loss issues. For this look, you need to prep your hair by tying it into a Bohemian French twist or any other hairstyle with a curl in front. 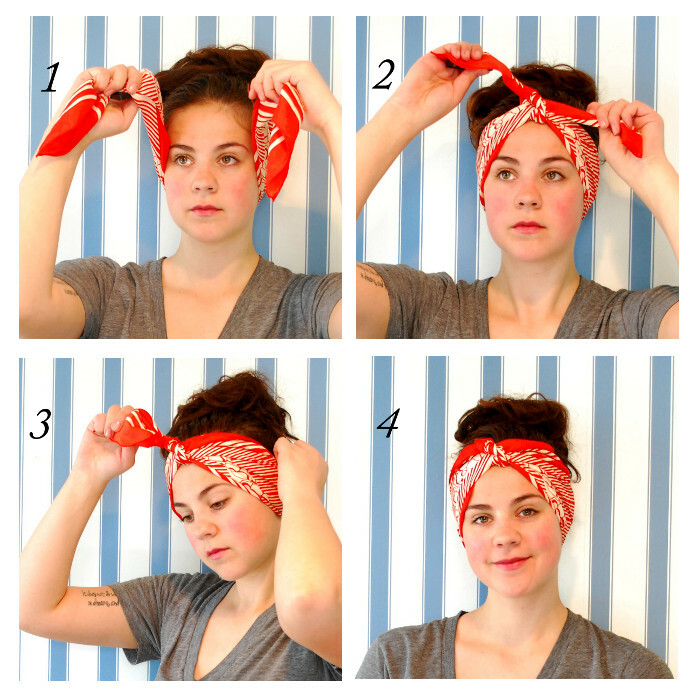 Fold the bandana into a triangle and wrap it around the back of your head. Bring the two opposite tapering ends together and tie a loose knot. Bring the 3rd end below the knot and tuck in its sides. Wrap the 3rd end around the knot and tie it tightly this time. If you don’t want the vintage look as described above but would like to use it as a turban, tie the knot described in step 2 just above the forehead instead of behind the hair curl. This style is perfect for girls who are passionate about motorcycle riding because it covers and protects their hair while giving them a cool look. 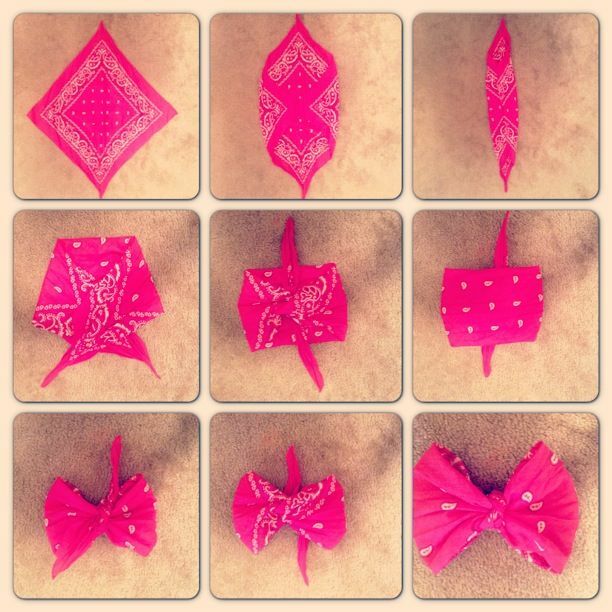 Fold your bandana in half. Wrap the longer end around your head and tie the corners at the back. To tie it like a chef, take a big bandana and tuck the free end inside the knot described above. 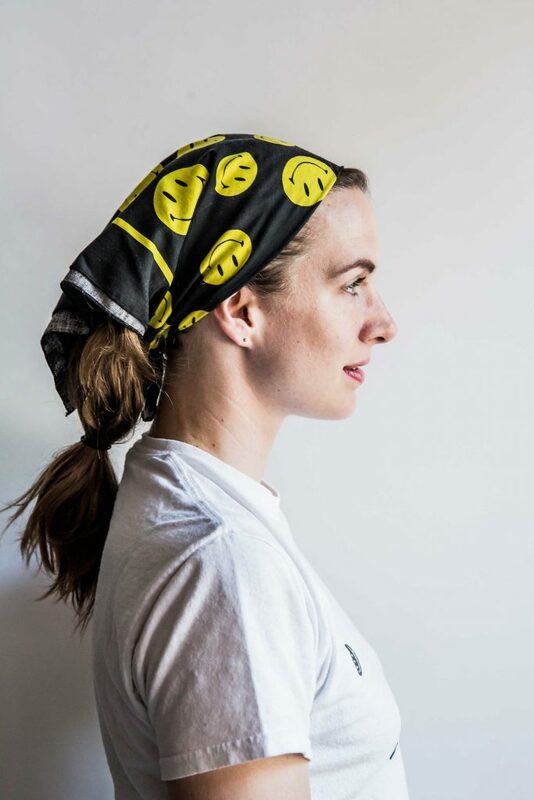 Apart from the head wraps mentioned above, you can tie your hair up in a ponytail and then wrap a bandana folded in a narrow strip around its base tying it at the back. Fold any two opposite corners to meet at the center. Fold the corners once more to meet at the center. Tie the tapering ends into a knot. Tie another knot in the front with the free ends of the knot from step 3. You can hot glue this to a regular headband or just pin it to your hair. Fold a square bandana into a triangle and start rolling it towards the tip. Stop when just the small triangular tip is visible above the roll. Wrap the narrow band of cloth around your neck from the back. Make a regular knot in front with the ends. Knot once more for added security and reducing the length of the end fabric. 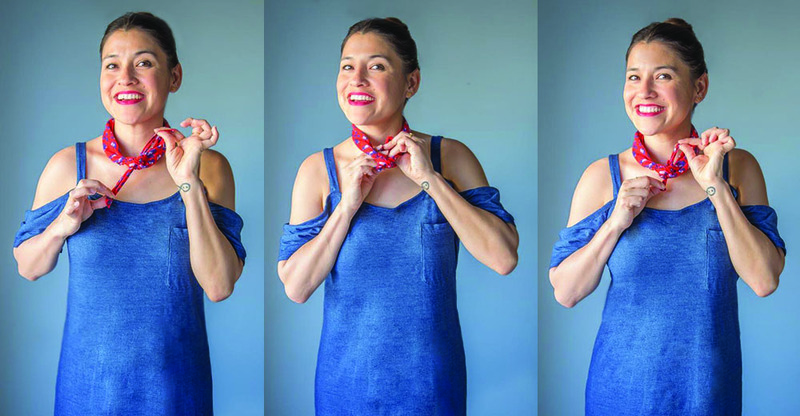 If you want the cute bandana tie to replace your choker, then instead of tying the knot in front, tie it tightly at the back. This brings the narrow fabric strip to the front giving it the desired look. Fold a bandana into a triangle. Wrap it around your neck and loosely tie the ends into a knot at the back. The ninja style face mask is good for sun and dust protection when you step outdoors. Wrap it around your mouth and nose. Tie it with a knot at the back of your head. Starting from the wide end, give it thin folds to reach the pointed end. It should be a 3-4 inches wide strip now. Leaving an end free, wrap it around your wrist a few times. After wrapping, you should be left with another free end. Tie the two together into a knot. You might require your friend’s help as one hand is fixed while tying the knot. You can also use this technique to tie a bandana around your arm, knee, and ankle. The bandana ties are quite simple and effortlessly glam up your outfit for casual occasions and parties. They are an unconventional and quirky alternative to jewelry. The suave styles are sure to get you noticed even on a busy day when you have little time to dress up.